“God is good.” It’s what my Baba, my Polish grandmother used to say and its true. Despite my failings and faults, which surface on a daily basis. Despite my too frequent stinginess. Despite the multitude of wrongs that I’ve committed throughout my thirty-six (nearly thirty-seven) years, God is good and he is making it abundantly clear to me of late that, while I had no real hand in any of it, his grace is sufficient enough to allow me to be in the path of the tapestry that he is hanging around this world. I’ve written several blog posts about my Dad’s influence on me over the past couple of years and, especially the last couple of months. In a nutshell, he was a selfless, simple, old fashioned man who let his walking talk far louder than anything he ever said. He certainly had his own views and not everybody agreed with him, but, he never turned down anyone in need of a hand and he never asked for anything he didn’t absolutely need or couldn’t get or do for himself. His neighbors knew him mainly through the chores and projects he helped them with or the visits he paid. His big belly (and mine) was a testament to his love of baking and cooking and eating. He served as a baker in the Air Force while stationed in Pakistan in the early sixties and, from what I’ve been told, he never had a flat stomach again. But, as much as he loved to eat, he loved to cook for others, more. He could always be counted on to invite us over for breakfast or supper, make a big breakfast for friends, and prepare and serve breakfast when they needed a fill-in at Rowan Helping Ministries homeless shelter. I remember, quite well, when I was told about the tumor that they found in my brain as a result of a CT scan in 1998. While I knew that he had no medical knowledge, his assurance that, “We’ve been through too much already to let this get in our way. We’ll get through this,” had a tangible, assuring effect on me. He was always there to help wherever it was needed. Rightfully so, he was the best man in my wedding. For him to say those words was a monumental indication of deep, deep pain far greater than the impression that would most likely be made by an average person walking down the street if they were to say the same words. He was a guarded person who lived with the mindset that “you never let ’em see you sweat.” He was guarded, but, he loved his grandchildren and enjoyed them more than anything and just when everything was finally going well, it all fell apart, for the final time. While he did, in a prayer I had with him around that same time, open himself up to God’s grace, the final months, and especially the final days, of his life were a tremendously difficult, confusing, dark, and sad time for him, for me, and for my Uncle John who was there with us. It was, surely, the worst experience in my life and it is one through which I’m having to continually sift through the personal wreckage on a daily basis. All of that being said, the value, the evidence of, and my reliance upon the hope and grace of God has never been more real or important to me than it has been over the past two and a half years since my Dad was first diagnosed. The twenty-third Psalm has become a staple that I’ve clung to, and often shared and discussed with Dad (with the help of a well-written book by Max Lucado on the topic). Simple, hopeful music – the likes of Johnny Cash hymns, worship songs from Travis Taylor, and Erick Cole, and the beautiful music of Josh Harmony, have been the steadily hopeful soundtrack to the hardest years of my life. Its been about eleven months since he passed away. Coincidentally, the weather tonight as I write – cold sleet and snow – reminds me of that night. It was the only night up to that point all last winter that it snowed here in North Carolina. It was, indeed, the coldest night. In the time since Angela and I worked our way through the overwhelming task of closing up his estate, burying his ashes back home in New York, and, eventually, selling his house just after Christmas. Though we’ve supported the likes of World Vision and Compassion International with sponsored children and have usually given when we saw the need, as a family, we’ve never been very good at fulfilling the very noble practice, that so many people do each week, of tithing a full ten percent of our income. It is a challenge that we certainly need to work toward meeting consistently going forward. But, we did make an intentional effort to tithe from what we were able to inherit from my Dad. Because of a variety of circumstances, including the blessing that I received when my mom (who I also have many reasons to be thankful for) and dad provided for me by adopting me as an infant, and the fact that the bible is pretty clear about the fact that Christians are to care for widows and orphans – “…the least of these…” – we chose to tithe toward Christian organizations that have ties to orphans and adoption. One of these organizations, that I learned about through my appreciation for the ongoing career of singer Kevin Max and his role as the new lead singer for the band Audio Adrenaline, is The Hands And Feet Project. The Hands and Feet Project established a program providing family style care for orphans in Haiti in 2004. 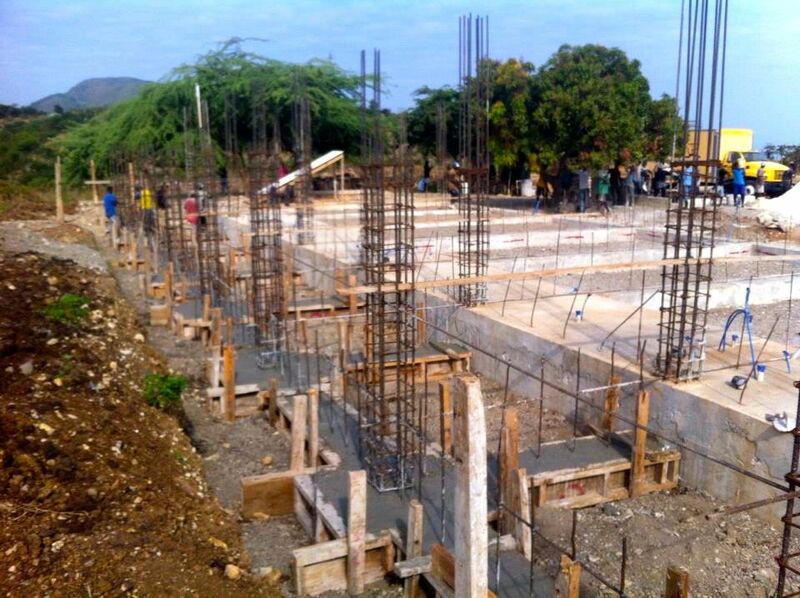 They care for nearly 200 children now and are currently in the process of constructing their third home in which they will provide shelter, care, food, and education for even more orphans in Haiti. They’re doing exactly what the bible instructs us, as Christians, to do: care for the most vulnerable. The process of sorting through my Dad’s belongings, paperwork, bills, and attending appointments with the lawyer, and trying to sell his house were a major stress for Angela and I on top of just moving through the typical grieving process that we all have to go through at one point or another and the offers that we were getting for the house were barely half of what it would take to simply pay off the mortgage. After several months with the house on the market and no good offers, we were starting to become concerned and our stress level grew. It was then that, in the midst of praying about it, the idea occurred to me to make a commitment to God that, if we could get the house sold and turn any kind of a profit, we would turn it over to The Hands And Feet Project. Well, within a couple more months we signed off on the final paperwork, handed over the keys, and had a profit of about $2,500. I sent it to The Hands And Feet Project late last week. Now, let me be clear, this isn’t some kind of pat-myself-on-the-back kind of message that I’m writing this evening. I’ve already admitted that our giving has never been a model of Christian charity and even the idea to make this commitment occurred when I was praying. The idea wasn’t mine. I can’t credit even an ounce of good to myself here. Instead, I’m sharing this because of what God has apparently been orchestrating all along with his own providence. It was through His good grace that there was even a profit from the house sale to donate. What can I say. Your email and blog has me in tears. What an incredible honor to your father to make a donation in his memory. I would like for the funds to got to something in his name. Perhaps our new kitchen on the mountain in Ikondo. We could honor his memory by calling it the Rockwell kitchen. What do you think? Immediately upon reading it I called my wife over and I did something I’ve never done before: I broke down and cried – out of sincere appreciation and overwhelming gratitude – for joy. How totally unexpected! And how perfect! The kitchen! It was the room in the house that my Dad appreciated the most! I was, and continue to be, completely overwhelmed by the sensitivity and graciousness of this gesture put forth by Mark Stuart and The Hands And Feet Project – and the connections made to it by Kevin Max. Just the notion that this kitchen – a place where food will be prepared for these beautiful kids – will have a plaque with my Dad’s name on it, in his honor – in Haiti …it blows me away! I knew my Dad better than anyone else and I know that he would be moved to tears as well. It is a gesture that I honestly don’t think even Mark Stuart knows the extent to which its power and hope extends. The experience of explaining to Julia and Jacob just how this honors their Grandpa – and the timing of it being revealed when my soul has been aching so deeply out of grief. Words cannot articulate the depth of appreciation that I have and how blessed and grateful my family and I are for this gesture in honor of my Dad. I spoke to Mark on the phone not long after getting the e-mail and he said that it will be a few months before it is finished, but, that, when it is, they’ll put up a plaque and take some photos to send to us. He also mentioned the idea of us coming down to see it some time and, after a couple of days thinking about it, I think that is exactly what we will try to do when we can work out when and how to make the trip possible for the four of us. But, when we go, I want to make sure that it is a trip in which we have the opportunity to help in the work that they are doing. I am continuing, with even more passion, and out of sheer gratitude for God’s grace, in my efforts to raise funds to support the expansion of The Hands And Feet Project in Haiti. Thank you, so much, to those who have sponsored my beard. You are helping, significantly, in the great work of The Hands And Feet Project. You are doing what Jesus asked us to do. For those who haven’t already, please consider sponsoring my continued beard growth at a rate of $5 per day for the number of days that you are comfortable sponsoring. My goal is to raise enough to ensure that my scraggly beard is still there, and bigger, on April 27th when I attempt to complete the Country Music Half Marathon in Nashville in support of The Hands And Feet Project. If you do, please let me know how much so that I can know the number of days to mark off from the number of days that I still need to have my beard sponsored for. Thank you, so much for your willingness to read this. If you feel inclined, please do contribute what you can to The Hands And Feet Project. The work they’re doing is so very, very important. This entry was posted in Audio Adrenaline, Body of Christ, Christian, faith, family, God, Gospel, grace, gratefullness, gratitude, Haiti, Hands & Feet (and BEARDS), Hands & Feet Project, Hope, humility, Jesus Christ and tagged Beards, faith, God, grace, Haiti, Hands & Feet Project, Hope, love, Mark Stuart, The Hands And Feet Project. Bookmark the permalink. Thanks so much Tom! I think that, eventually, there will be at least a few shows featuring Tobymac, Newsboys, and AudioA – and a segment where dcTalk reforms. And that stuff is all neat and cool for ol’ CCM fans like you and I. But, this whole Hands And Feet Project aspect is what has really hooked me. I think we’re now planning on a summer ’14 family trip down as part of a short-term mission group to contribute and also see the kitchen. You and I REALLY need to get together though!